HomeOur Blog“The Filipino-American. That’s a market, a community & an opportunity. Yes! 3.5 million of them and still growing. Very glad to have connected with the Filipino-American Chamber of Commerce of Greater Nevada. Please read the newsletter from FACCGN. Discover how to effectively Source, Ship and Sell Philippine Products to the USA. International, Ltd.The event was attended by 30 participants from the different sectors of trade and government from retailers, manufacturers, small business owners, e-commerce practitioners, community advocates and trade service professionals. You got the product…how do you sell it or market it using design, social media marketing and digital marketing? That’s a market. That’s a community. That’s an opportunity. Yes! 3.5 million of them and still growing.” How to create your own eCommerce site. Product sourcing using online directory product portal “www.planet63.com”. In summary, the seminar offered a “nuts and bolts” presentation of how to find those products, sell and ship from the Philippines to the USA with the US exporters who want to market to the Philippines and importers who wants to make it easy to import the right way. In a nutshell, in the age of online retailing and the easing of geographic and cultural barriers, this Seminar fulfills its basic goal to help navigate the growing digital commerce terrain and at the same time, promote Philippine products and develop the Filipino-American entrepreneurs and trade. 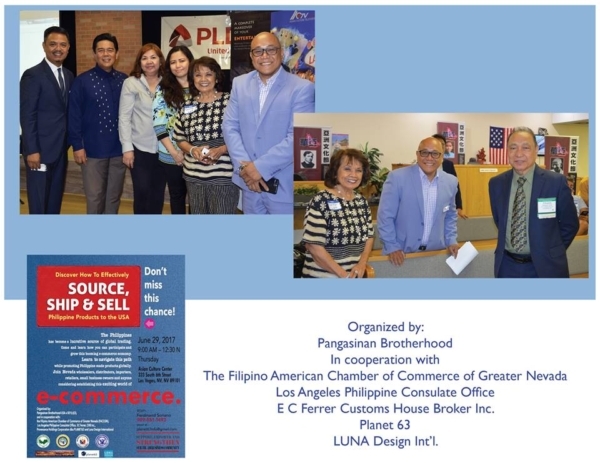 We thank the sponsors (Philippine Long Distance Telephone), ad cooperators, notably Mr. Ferdinand Soriano of Planet63, Eddie Ferrer, Consul General Adelio Cruz, the Asian Culture Center, FACCGN, presenters and attendees for making this a success. 0 Comments on "“The Filipino-American. That’s a market, a community & an opportunity. Yes! 3.5 million of them and still growing."